At Vanna K, we primarily feature platinum settings throughout our entire collection. The reasons for this are beyond what is simply trending in fashion right now. There are advantages to each of our favorite precious metals, which have been highlighted for you. Platinum is most couples' first choice in precious metal. It's steely white color won't change over time, and it is truly a rare metal. Platinum is more dense and malleable than gold, so naturally, the prongs are more likely to resist injury. A platinum engagement ring is the ultimate choice in precious metal. It's hefty weight, feel and durability is unsurpassed. While over time platinum will take on a brushed, antique look called "patina", it can easily be polished to look as if it is new. However, after years of wear, It can be much more difficult to get this same polished "new" look in gold. Premier designers like Vanna K prefer to work with a white metal (platinum or white gold) when creating diamond jewelry. This is because the near-colorless diamonds used in the setting will refract light. A white metal, especially one as pure as platinum, will allow that light to refract in a pure, bright and brilliant way. Hence, the result makes the color grade of the diamonds look more white. Additional differences between platinum and gold are the purity levels between the two. Yellow and white gold are mixed with other metals in order to achieve karat status. This can cause issues in maintenance and can also cause chemical or allergic reactions to those who wear the jewelry, sometimes even causing a discoloration to their skin. However, the platinum used in our facility is a very close to "pure" metal and is also hypoallergenic, which makes it ideal for those with sensitive skin. Gold still has many advantages in its court as well. For many, the timeless tradition of gold, and the symbolism of status and power cannot be matched by any other metal. Gold is also a form of currency in this world that is currently growing in value. There are many women whose skin tones simply look better against a yellow gold. Or if you prefer the white metals / silver tones, white gold is a much better option for those wanting the look of platinum, with a more affordable price tag. Most importantly, gold is luxury defined and will undoubtedly maintain its status through every trend for the rest of time. Ultimately, it is your choice in which metal you choose for your unique diamond engagement ring. 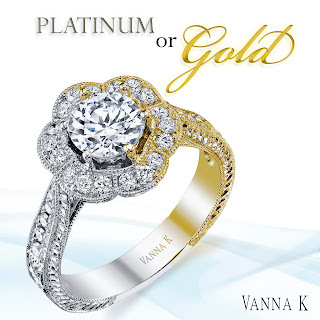 Vanna K uses the best in platinum, as well as the purest 18K gold. With the key differences between platinum and gold clarified, you can now make the most educated choice as to what is right for you. And, no – there is no wrong answer, as long as she says yes. For more information on these precious metals, visit www.platinum.com or www.gold.org.